Purchase orders are created and approved within Order Time. Up to 5 purchase orders are downloaded from the Order Time server into the device. The user is free to walk around; and uses the device to scan order items. The user submits their scans back to the Order Time server. One or more Receivers are created within Order Time. Scan or type up to 5 purchase order Doc Nos. Purchase Order List Screen: After the Purchase Orders have been downloaded to the device you will see the Purchase Order List. 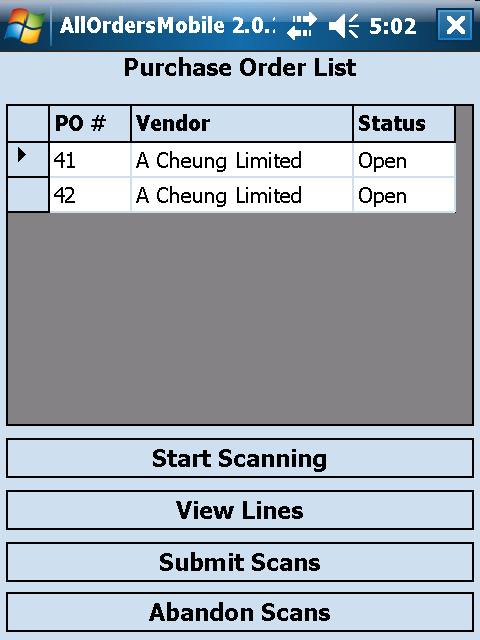 From the Purchase Order List, click Start Scanning. Item: The Items panel shows the item that is currently selected for receiving and the total quantity ordered and the total quantity that has been received for all purchase orders on the Purchase Order List which have been downloaded for the current picking session. If, for example, you have an item which is on 2 separate Purchase Orders that have been downloaded, one with 1 unit ordered and one with 2 units ordered, the total ordered for the selected item will be 3 units. Order: The Order panel will show the order # that is currently selected for picking and the quantity ordered and the quantity that has been received for the currently selected item for only the currently selected order. Scrolling through the items will change the item that is currently being received. Click Tot. Ordrd. (Total Ordered) to view all of the line items that need to be received for all purchase orders on the Purchase Order List which have been downloaded for the current receiving session for the currently selected item. Click Tot. Scnd. (Total Scanned) to view the Scan List Screen. This screen will show all of the line items that have already been received for all of the downloaded orders for the currently selected item. Scrolling through the Order Panel will change the sales order that is currently being received. 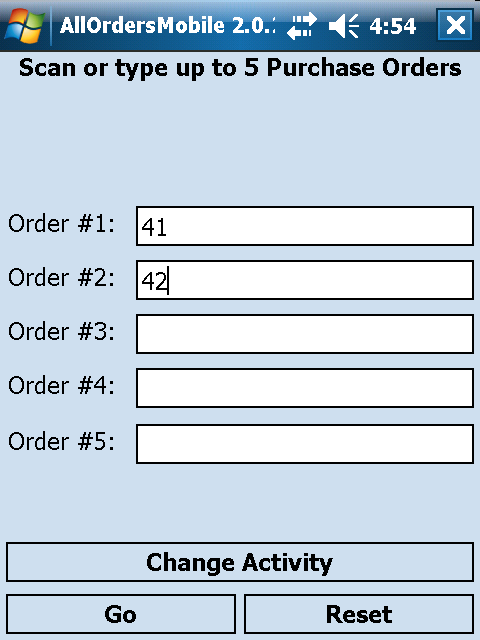 Ordrd (Ordered) will display how many unit are ordered for the currently selected line item on the currently selected order. Scnd. (Received) will display the current quantity that has been received for the currently selected line item on the currently selected order. 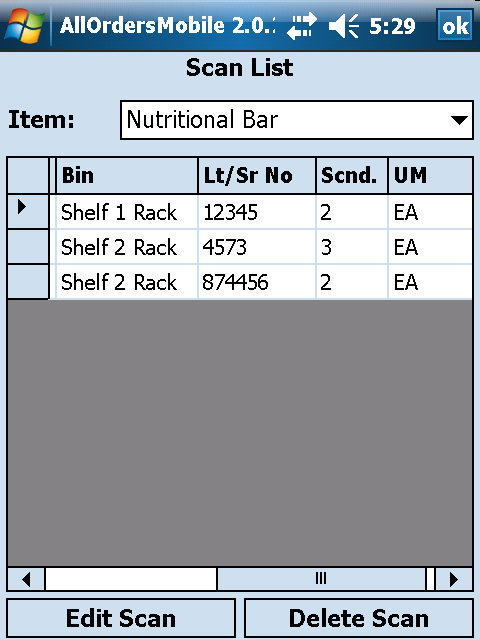 Scrolling through the bins will show where in your warehouse the items are located and available for picking. Use the arrows next to the bins to scroll through them. Scrolling through the bins will also change the Item panel. When you pick an item it will take the inventory from the currently selected bin. Click on the Avail. button to view more details on availability. In addition, if the current item has Lot/Serial #s, clicking the Avail. button will display the Lot/Serial #s that are currently available for picking and allow you to manually pick them. The bottom portion of the screen is used for scanning and entering item information. Check the AutoScan box if you are going to be scanning with a bar code reader on the device and want to increment the quantity received by 1 each time a scan is performed. Be sure to set your escape character on your scanner to be a Tab to ensure it functions properly. Leave AutoScan unchecked if you would like to enter the item name manually, select non default bins, or need to manually enter quantities. You can still scan the item by placing the cursor in the Scan Item entry field and then scanning the bar code. 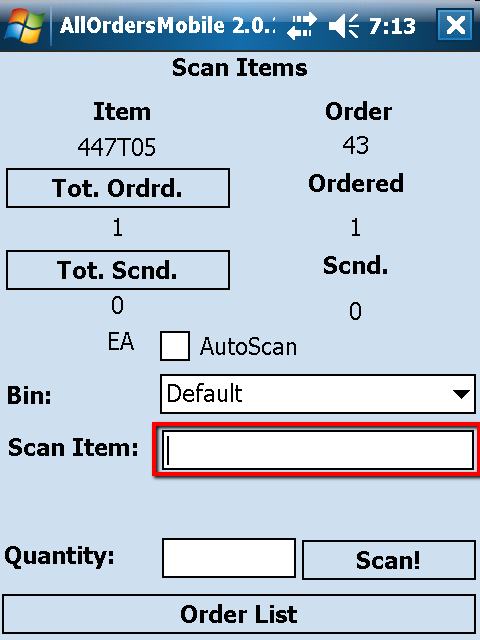 Once the Scan Item entry field has an item name or bar code entered, a bin has been selected (if the item is not being received into the default bin) and the quantity field has a valid quantity, click the Scan! button to receive the item. This will 'Receive' the specified quantity for the specified line item once the transaction is submitted to Order Time. You will be required to either scan or manually enter a Lot/Serial # before a line item that has Lot/Serial #s can be received. As you are scanning, scroll through the items and then the orders in the top portion of the screen using the appropriate arrows until you are finished receiving all of the line items. Click Order List when you are ready to return to the Purchase Order List Screen to review your picks and then either submit or abandon them. You will see some screen shots from All Orders (NumberCruncher's desktop app) but All Orders Mobile works the same way for Order Time.